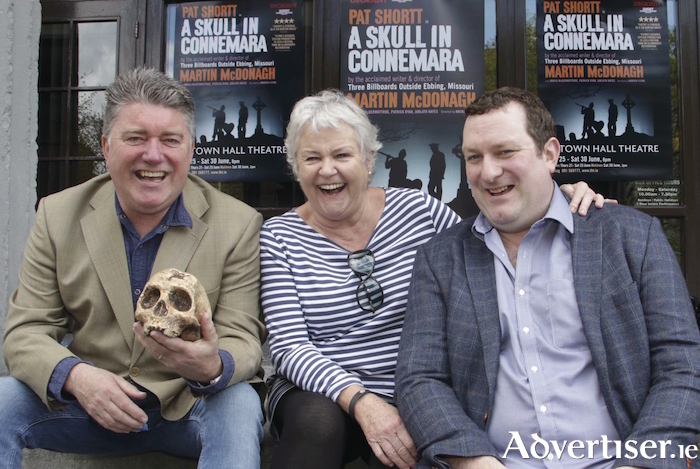 DECADENT THEATRE Company hit the Town Hall Theatre stage next week with a revival of one of its biggest hits; Martin McDonagh’s scabrously funny black comedy, A Skull in Connemara. Directed by Andrew Flynn, Decadent’s production enjoyed hugely successful tours in 2013 and 2014 and this latest outing looks all set to be another sell-out smash. The play centres on gravedigger Mick Dowd (Pat Shortt ) who, each autumn, has to disinter the bones in certain sections of his local cemetery to make room for new arrivals. As the time approaches for him to dig up the bones of his own late wife, nasty rumours regarding his role in her sudden death seven years earlier begin to resurface. Nosey neighbours, troublesome teenagers and an ambitious garda further add to this macabre, yet hilarious, play. Taking the part of village busybody Maryjohnny Rafferty is Maria McDermottroe, one of Ireland’s finest actors and, during a break in rehearsal, she sat down with me to talk about the show. McDermottroe’s CV includes films such as The Dead and Angela’s Ashes, the TV roles of Venetia in Glenroe and Mrs Gilhooley in Killinascully, and a string of stage appearances with many of our leading theatre companies. As Bloomsday is almost upon us, I began our chat by asking Maria about her recollections of playing the feisty Molly Ivors in John Huston’s film of James Joyce’s The Dead.